BJP national president Amit Shah said that "the more Left parties indulge in violence politics the more will the lotus bloom"
Amit Shah began Jan Raksha Yatra from Central Park in Connaught Place to the CPI-M office in Gole Market. 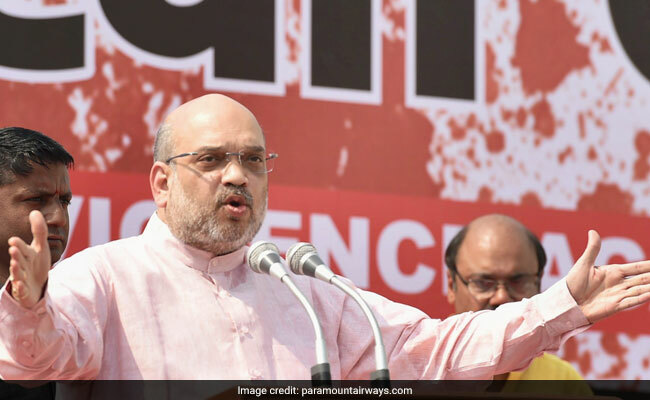 BJP President Amit Shah today slammed the CPI-M government in Kerala over the "political killings" of BJP-RSS workers in the state, saying it was being done to "instill fear" among the people and prevent the BJP from expanding in the state. Mr Shah while addressing a Jan Raksha Yatra in the national capital also alleged that the political killings in Kerala were being carried out on the "orders" of Chief Minister Pinarayi Vijayan. "Since the CPI-M (Communist Party of India-Marxist) government came to power in Kerala, over 120 BJP workers have been killed. They killed them brutally," Mr Shah said participating in Jan Raksha Yatra from Central Park of Connaught Place to the CPI-M central office in Gole Market. Mr Shah asked when a man can be killed with a bullet "why are the Bharatiya Janata Party (BJP) workers being hacked into pieces?" "It is being done because they want to give the message that if anyone supports or joins the BJP they would be killed. It is being done to instill fear in the minds of the people not to support the BJP there," he said. He was joined by Delhi BJP President Manoj Tiwari, Vice President and in charge of Delhi Shyam Jaju, party's national office bearers, lawmakers, MCD leaders, and state office bearers. The BJP president also said that "the more Left parties indulge in violence politics the more will the lotus bloom". He said for BJP workers, their party is the ideology and they are "not scared of sacrificing for the nation and the party ideology". "Remember one thing, the BJP workers won't tolerate many killings of its workers. We won't reply violence with violence as we are not communists but we will spread awareness against political killings," he said. Mr Shah also said that most of the killings happened in the home district of the Kerala Chief Minister in Kannur. "In Kerala, when BJP people are killed no arrest is made... All the murders are being done on the orders of the Chief Minister," he alleged. "I want to tell the Communist and Congress who supports their ideology that Communism has ended in the world and the Congress has ended in India," Mr Shah said. "And the BJP which started with only 10 party members, is now the world's biggest party with over 11 crore party workers," he said. Slamming human rights groups for taking out candle marches against the killings of Leftists in the country, he said, "Violence is violence. And I challenge the champions of human rights who take out protests to condemn the killings of a communist worker why they remain mute when our party workers are killed." "Why cannot we see you taking out candle marches for our workers? The selective protests for the communist workers have exposed you people," he said. Mr Shah also urged BJP workers to stand with party workers in Kerala who despite facing multiple difficulties were "working hard" to expand the party in the state and spread awareness across the country against the political killing in Kerala. He alleged political killings were visible only in West Bengal, Tripura and Kerala, where the CPI-M has ruled for long. "Wherever they have remained in power they have promoted politics based on violence. BJP will face these forces in all the three states," he added.